This page is in memory of those BPA members who are no longer with us. We valued their fellowship and miss their presence. Please keep their family and friends in your thoughts and prayers. Submit information regarding your departed friends who would appreciate being remembered in this fashion. Include where they were from, significant dates, and up to 750 words about them. Send it to webmaster@boardgamers.org. On Saturday, May 13, 2017, after a short and intense battle with cancer, Henry Richardson, 68, of Warrenton, Va., passed from this life. He graduated from Sherwood High School and then spent several years studying at the Case Institute of Technology (now Case Western) in Ohio before graduating from the University of Maryland with a degree in Mathematics and a minor in Japanese History. He later went on to earn a Master´s in Telecommunication Policy from George Washington University. Henry married the love of his life, Karen Jean, and together they welcomed seven children—Rita, Sarah, Henry III, Patrick, Margaret, Thomas and Karen Elizabeth. Henry worked for the Verizon phone company for nearly 30 years. After retiring, he spent the last 15 years engaged in a variety of pursuits, including teaching math at St. John the Evangelist Catholic School and at All Saints Catholic School, tutoring, participating in the annual WorkCamp for the Catholic Diocese of Arlington as a nighttime security guard, and most importantly, joyfully living out his vocation as faithful husband and loving father and grandfather. As a lifelong boardgame enthusiast, Henry passionately shared his love of games with everyone, especially his family, and regularly attended the annual World Boardgaming Championships. Henry was very active in the BPA. “With his philosophy of 'If you can't find opponents, grow them! ',” Henry passed on the boardgaming hobby to each of his seven children—all of whom still enjoy it today! He served as GM for several games including Air Baron and 1989. Henry also participated in BPA events for Victory in the Pacific, B-17, and Hannibal: Rome vs. Carthage among many others. His favorite two player game was For the People. His favorite multi player game was Power Grid. Gentle, humble, persevering, sharp-witted, generous, self-sacrificing, and sensitive to others' needs, with a sense of humor the size of a giant, he was gracious up to the very end. Donna lost her battle with cancer on Dec. 3. Donna was a very outgoing person who enjoyed life to the fullest, traveling extensively and pursuing her hobbies which included singing, community theatre and square dancing in addition to boardgames. She remained active in journalism/communications in a career that spanned 40 years. Her participation in WBC can be traced back to the first year in 1999 and remained steady through the present—missing only one year due to a scheduling conflict with the World Science Fiction convention—even after moving from her native Ottawa to Nova Scotia in 2013. She was a stalwart of the WBC railroad game community, winning Empire Builder in 2003 and Rail Baron in 2012. In all, she won laurels in seven different games for a total of 207. She is survived by her husband, Jim McCarthy, a sister, two step-children, and six grand children. The rail events will be a little less bright this year without her constant smile. Jason Ley was struck down unexpectedly in the prime of life on Oct 21, 2016 when struck by a drunk driver. Jason was one of our West Coast regulars, making the trip from his native Washington like clockwork for the last ten years. He won laurels at the very first WBC in 1999 and in 14 of WBC’s 18 years. He had expressed pleasure with our new location and was looking forward to returning for year 2 at Seven Springs. Jason was fond of many of the same things that interest most of our gaming acquaintances. He liked good food, movies, science fiction and computer games, but his favorite activity was playing board games. When he enjoyed a game, he often became very good at it. He regularly collected laurels in his favorite games, amassing 595 of them. Through the Ages and Titan were his passion, winning WBC titles in both. He also played a number of other games, earning titles in Small World and Acquire, and laurels in Puerto Rico, Power Grid, Saint Petersburg, Union Pacific and Tikal. His most recent honors included laurels in Seven Wonders Duel and Lords of Waterdeep in his last WBC. Despite his many successes, he never expressed an interest in the Caesar award, but he was certainly viewed as capable of such an honor if he ever decided to try for it. He never was much for exclaiming how well he did. When his family found his collection of "wood" they were mystified as to what it meant and amazed by the extent of his success. Jason actively tried to recruit additional players to his hobby. His gaming circle included multiple local gaming groups. He was not opposed to traveling two hours north to Seattle or two hours south to Portland to enjoy an afternoon of gaming with groups in those locations. He was becoming quite interested in some of the 18xx variants during the last year, and enjoyed playing 1822. On his last evening with us, he spent Thursday night playing 1822 with a group in Bellevue. It was on his way home from this session that he was taken from us. "Mike Hazel was a part of our group for more than 30 years, since before we were a group and since long before Keith Hunsinger dubbed us The Greenville Mafia. Over the decades, I played thousands of hours of games with Mike and sat around and talked with him for thousands of hours more. When you spend so much time together, you get to know someone pretty well. "Let me tell you about the Mike I knew: In many ways, he was the best of our group (and I like to think we are all good guys and gals). He was the best husband I know. He loved his wife, Kathy, unconditionally. He was a great father—nobody better. He was proud of his children, invited foster children into his home, and was tremendously excited over his new grandchildren. He was the kindest man I have ever known. He was also the most patient man I’ve ever met. He loved teaching and coaching, even driver’s ed. (Did I mention he was the most patient man I have ever met?) I think he liked the idea of making people, and the future, better. He made a difference. There was nowhere we ever went that he was not recognized and spoken to by the young people he had taught or coached. Their respect and affection for “Coach” was always obvious. He was proud of his Unitarian father, and his stand on social justice. He told lots of stories about living through the Civil Rights movement in the South. He had a great sense of humor, and these stories were always both funny and terrifying. He was the most liberal of us and totally unapologetic about his views. I remember clearly the day he told me he had quit trying to see both sides of the issues and that as much as he loved some folks as people, he just could not be around them anymore. Oh, and Mike was a good gamer. Over the decades, he played all kinds of games with all kinds of people, and I never saw him get mad, or even upset. He was particularly fond of heavy, mathy Euros, most notably El Grande. He registered and paid for WBC every year, even though in recent years family health problems often prevented him from attending. Hope sprang eternal. He liked to win, but he was much more interested in how the games unfolded. John Emery is the undisputed “don” of the Greenville Mafia, but Mike Hazel was its inspiration. My visits to Greenville were far too few but even to an infrequent visitor the reverence the group held for its senior member was all too obvious. Coach was present at the birth of WBC and attended regularly until health issues cut his travel. He did manage to rack up one title (Superstar Baseball) and 93 laurels, but his real accomplishment around the game table was spreading goodwill. If you didn’t like Coach, you didn’t like life. Yes, he will be missed whenever we gather every summer but he will be remembered most fondly by the many whose lives he touched. Ultimately, that is all any of us can ask for. A life well lived. 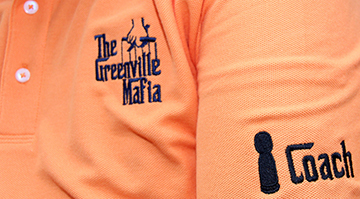 As a living memorial to Coach, the Greenville Mafia remembered him on their new group shirts with a sleeve patch. Like a favorite ballplayer, Coach is gone but not forgotten. Eric Matthew Ritter, 36, of Topton, died unexpectedly in his residence, Wednesday, March 16, 2016. Eric was a gaming enthusiast, Star Wars fan, and a lifelong student of history—enjoying various forms of WW2 wargaming (including Axis & Allies, War at Sea, and Flames of War). Very unassuming, friendly, funny and would always talk about how bad he played, despite having actually won an 1817 heat last year at WBC! He was a free spirit, with a kind heart, and an amazing capacity to find wonder in small things like 18xx spreadsheets. At WBC, he finished second in Kaiser’s Pirates in 2009 and 6th in Acquire in 2012, and also played 18XX, Championship Stock Car Racing, and Speed Circuit. May the Force be with you, Big Guy. Contributed by Kelly Krieble. Kevin died suddenly on Feb. 15, 2016. In addition to his excellent game playing skills, Kevin will be long remembered for his love of games of all kinds and his even-tempered, calm demeanor in all situations. Kevin obtained his BS in computer science from Wayne State University in 1985 and later received a Masters from Oakland University. During his career as an IT professiona,l he worked at Verizon and was a consultant for Navigant. He most recently was an Architect Engineer for the Office of Comptroller of the Currency. In addition to being an avid player, Kevin was an accomplished game designer, with several creative designs in progress. Although a worthy competitor in any game, Kevin gravitated more to open gaming in recent years. Notwithstanding limiting his tournament competitions, 2015 marked his most successful year at WBC, as he won both Manifest Destiny and Global Mogul tournaments to bring his total number of BPA titles to seven. His 510 BPA laurels began to accumulate in 2001 with a 4th place finish in Age of Renaissance—the first of 26 tournaments in which he was counted among the finalists—virtually all of them multi-player games. Kevin was a regular participant at numerous other local game conventions. One of his favorite games was Napoleonic Wars. Two of his more memorable championship games at the Waterloo mini-con are remembered in the 2007 and 2008 AARs. One of them was the most enjoyable game I’ve ever witnessed as a non-player. It was like watching a historical film unfold as his French won in truly epic fashion with an invasion of Russia that succeeded on the last CP of the last card with his last unit. Looking back on it now gives new meaning to the archives of our vicarious achievements documented here as precious reminders of those bygone enjoyable contests and the affable opponents who made them possible. Whenever Kevin was with you at a table you knew you would have a great game, tough competition and an enjoyable time. He will be sorely missed. He is survived by his wife Yvonne and his children, Katherine and Alan (a/k/a A.J.) who carries on in his father’s gaming shoes with some memorable achievements of his own. Contributed by Bill Crenshaw. Murray died on his 83rd birthday on March 21, 2015, from a fall in his nursing home. Murray had been a regular at Avaloncon, last attending WBC in 2008 when advancement of Parkinson’s Disease brought his traveling to an end. While most of his gaming exploits predated laurels, he nevertheless managed to laurel in Tigers in the Mist on three different occasions. Murray lived a remarkable life filled with both accomplishment and adventure. He was a merchant seaman in his youth. He went to sea in the old sailing vessels when he was 14 and passed his mate’s ticket at 17, joining the Elder Dempster Line. He rose to First Mate and Navigating Officer in the Merchant Marine, retiring at 30. He remained in the Royal Naval Reserve until 42 when he had risen to the rank of Lieutenant Commander. He then trained for business and passed exams in Insurance and Accountancy and after, a spell in other companies, he formed Murray Cowles Associates and The Fleet Friendly Society. He retired at 60 and became a New Business Adviser, helping many people to start up their businesses and providing expert financial advice while continuing with voluntary work in the local community. An ardent wargamer and train gamer, Murray also enjoyed rock climbing until a very bad fall curtailed that. He made numerous visits to cons in both America and Italy, two countries he loved. It was his everlasting regret that his illness stopped those visits far too soon. During one of his visits I had the pleasure of his company for a five-hour game of Breakout Normandy that remains one of my fondest memories; a more entertaining and gracious opponent I have never met. Murray was a fixture at the UK cons organized by AHIKS and more recently by The Weekend Gaming Group. He had many friends both in Britain and among the American gaming community and will be sorely missed. Andrew died suddenly on Feb. 26. A native of Wales and a graduate of the Imperial College in London with a degree in physics, he he had a successful career in the IT industry, earning an early retirement that allowed him to actively pursue his twin passions of competitive bridge and boardgaming. His knowledge and appreciation of history, combined with an excellent grasp of the English language and story telling skills that seem inbred in our English comrades made him a popular participant in battle recollections at the watering hole. Andrew’s passion for wargames did not allow a little thing like the Atlantic Ocean to stand in the way of his hobby—crossing the pond every year since WBC’s inception to participate. He amassed 583 laurels in six different events—winning multiple titles in both Breakout: Normandy and Squad Leader. He was one of only two people to complete the BKN triple crown by winning WBC, D-Day Swiss, and BPA PBeM titles and ranked third in lifetime laurels with 316. He also served as the WBC BKN GM since 2006. Such was his passion for the game that he crossed the Atlantic a second time each year from 1998 to 2006 to participate in the D-Day mini-con—a five-round swiss tournament test of endurance that drew the best of the best. He won that title twice—taking my measure both times. A match against Andrew was always a guarantee of a tense contest fought to the last dice roll. There will be one less shark in the BKN pool this summer where he will most definitely be missed. He is survived by his wife Jill, two children and two grandchildren. We sadly report the passing of longtime member Paul Van Bloem, 53, of Sykesville, MD on January 14. Paul founded the computer consultancy, Little Green Software, which he ran for three decades before taking employment with Lockheed Martin. An avid bicyclist and boardgamer, Paul was an active railgamer—playing supporting roles in the administration of Rail Baron and Empire Builder tournaments for many years, and placing second in both, but never achieving the grand prize. He amassed 104 laurels in WBC rail events and will be sorely missed by his fellow train gamers. Richard passed away on Oct. 30, 2014, after a long illness. A lifelong gamer and avid game collector, Richard had been active at WBC for many years, making the long trek from Minnesota annually, first winning laurels in 2003. Neither distance nor declining health kept him from pursuing his passion for boardgames—making the last of his trips in 2011—with the aid of a wheel chair, oxygen tank, and the aid of his devoted wife Marla. Richard, an avid Red Sox fan, was best known for his mastery of the Superstar Baseball game, having won the event three times, and his 30-year involvement in a Strato-Matic Baseball league. He reached the pinnacle of his tournament success in 2009 when he combined wins in SSB and B17 to take Consul honors for the year. In all, he won laurels in seven different events while amassing a total of 359—174 of them in Superstar Baseball where he remains the top-ranked player in career laurels as of this writing. A longtime member of the 1st Minnesota Historical Wargame Society, he will be missed by his compatriots for both his sportsmanship and good cheer. We are sad to report the death of longtime member William Duke after an eight year battle with cancer. A resident of Pasadena, MD, Bill passed away on 17 July 2014, just shy of his 58th birthday. He was survived by his parents and three siblings, a wife, daughter, and one grandchild. He served in the U.S. Air Force and retired from the National Security Agency. He was an Eagle Scout and member of the Civil Air Patrol. Bill was a member of the Games Club of Maryland, and a regular participant at the WBC as long as his health permitted. He was a past champion of Rail Baron and frequent finalist in Settlers of Catan, among others, having amassed 166 laurels over an 11-year period. John had been an active member of our hobby since the start of our organization, having first attended Avaloncon with his father, Joe, with whom he shared his boardgaming hobby. His gaming interests spanned many genres but he was best known for his fondness for card driven wargames as a regular at the Winter Activation Meeting mini-conferences for those games. His 180 laurels included tournament championships in Here I Stand and Sword of Rome, but his laurel footprint included high finishes in tournaments as varied as Decathlon, Tikal, Air Baron, Pacific Victory, 1812, Union Pacific, Formula De and 1960. Outside gaming, John was the environmental engineer manager for the division of planning and permits and was an avid cyclist. Memorial contributions to support pancreas research at Johns Hopkins can be sent to Johns Hopkins University, Ralph H. Hruban M.D., Johns Hopkins Medical Institution, 401 North Broadway, Weinberg 2242, Baltimore, MD 21231. Capt. Paul R. "Dr. B" Bolduc, Ph.D, 61, died peacefully in his Fort Walton Beach, Fla., home with his wife, Meg, by his side, on Aug. 31, 2011, after a long battle with cancer. Dr Bolduc was a regular attendee of WBC going back to the days of Avaloncon when he was active as the GM of Wizard's Quest for a small but dedicated group of mostly younger players. Although that event fell out of the competitions never to return, Paul continued to attend WBC faithfully every year and missed his first one this past summer. He had laurels in Gangsters, Circus Maximus and Union Pacific, among others, and twice won WBC tournaments. He served in the Air Force as a navigator on an AC-130H gunship. After entering civil service he was reassigned to the Environmental Department on Eglin Air Force Base as a physical chemist. His interests included home brewing, gaming and Stage Crafters. Paul will be remembered for his dry humor and honesty. He was buried at Barrancas National Cemetery with full military honors. Memorial donations can be made to the American Cancer Society, Wikepedia, ACTS, or Cyberboard. Please visit www.daviswatkins.com to express condolences and share memories. Bob Dwyer, a Charter Member of BPA, has lost his battle with cancer. Only 55 years old, his red head and constant grin were a constant sight at WBC. Bob was a major member of the Jersey Association of Gamers. His obituary and a link to a guestbook for condolences can be found at http://obits.nj.com/obituaries/starledger/obituary.aspx?n=robert-m-dwyer&pid=149825466. If you would like to make a donation in Bob’s name, consider the Oncology Dept at Overlook Hospital in Summit, NJ, or the American Cancer Society. Gerald missed his first WBC this past summer due to the illness that eventually took his life. He was especially active in Circus Maximus and Speed Circuit, being one of only three people to win Speed Circuit more than once in its 20-year history at WBC. He had participated on the Koleszar Lientz Plat team at WBC for several years. Gerald had retired at 52 and spent a good portion of his retirement years attending gaming conventions far and wide. He and longtime gaming friend Jake Jacoby made regular tours of flea markets to acquire games to resell at the WBC auction. A few years ago, Gerald won the Settlers of Catan Regional Championship and advanced to the National Championships. Tom Dunning was a great gamer, good teacher and friend of gaming. Tom's passing will leave behind a giant hole in the Western New York, Euroquest and WBC gaming scenes. Tom was an exceptional Euro gamer and held a special place in his heart for all train games and auction style games. He loved competitive tournaments and yearly traveled to participate in Euroquest and the WBC along with playing in many of the BPA PBEM tournaments. Over his years of competitive play, Tom managed to rank in the top 25 gamers and won 10 tournaments. One of his most notable wins was his first Empire Builder plaque which had him negotiate the purchase of the map from the final to preserve the crayon rails for history. Tom's love for Empire Builder eventually lead him to GM the tournament. Bill Peeck said about Tom, "Tom was one of the toughest gamers to beat that I ever played. If you managed to beat him, it was not by much and you knew you had played your best game that day." Tom was always open for any gaming, even after working an overnight double shift. He even won games while napping between moves! Tom was also an expert Scrabble player. Additional memorials to Tom from friends are posted on BoardgameGeek. 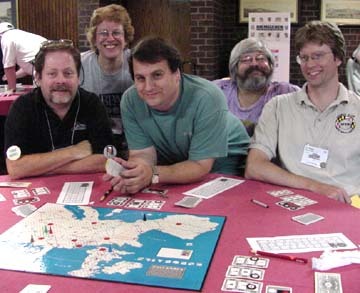 John Popiden was a longtime boardgame enthusiast who actively pursued his wargaming interests. Those interests led him east to his first WBC in 2004 where he made an immediate impact with his skills in the traditional hex wargames and was a regular visitor in the years since, racking up 310 laurels in six years. He won titles in both Afrika Korps and Panzergruppe Guderian and was active in BPA email tournaments as well as at WBC. More importantly, he won instant friends with his quiet and friendly manner and was admired for his sportsmanship. He will be sorely missed this summer. Tom Johnston said about John: "I had the honor and privledge of playing John in the latest round of the online Afrika Korps tournament, he was the Allies. He thought he had me on the ropes a couple of times but I got out. I had him a time or two, but he showed me why he is a master at AK. Ultimately his skill won out. I consider it a compliment that he enjoyed our game so much he wanted to play friendly game with the sides reversed. I was so looking forward to seeing how the Germans should be played." Hal Haag had and wore many hats—father, collectyor of fine art, gamer, reader, web designer, and employee—to mention a few. He enjoyed a great variety of games, including Genial, Ticket to Ride, Alhambra, Caylus, Amun-Re, Yspahan, Age of Empires III, and Settlers of Catan. Though Hal's specialty was Carcassonne, it was strongly suspected that he loved the meeples more than the game. He ran tournaments at EuroQuest. He had many friends to laugh and smile with. Tony Cadden passed away on Jan. 6, 2006, after a long illness. Tony loved gaming, including trivia and wargames. Tournaments he played at WBC included History of the World. He was also a civil war buff, owning lots of period items and frequently particpating in renactments. Tony had served in the Marines. Harold Siegelman attended Enlighenment, WBC, and EuroQuest. He was an active player who made the game enjoyable for everyone involved. He ran Mexica at WBC in 2002 and played Monsters Ravage America. He was one of the most active and competitive gamers in the Games Club of Maryland. As well as being an accomplished Euro-Gamer (including Puerto Rico and Prices of Florence), Harold was also a competitive tournament bridge player and was known for his prowess playing games online at BrettspielWelt, where he went by the moniker “Shlimazl.” At the time of his passing, Harold was looking forward to helping GCOM organize EuroQuest, and much of the format and prize structure for the wildcard event was based on early input from Harold. It’s always a sad day to report the passing of a member of the gaming fraternity, especially a premature passing. Those of you who attended the 2000 WBC remember the 2-man Massillon, Ohio contingent, Dave Streamo and Ron Dietz, who blitzed the field with identical 4-1 records in their first tournament appearances. Dave lost a tiebreaker to make the final four and finished 6th; Ron took 4th place overall. Herewith an appreciation of Dave Streamo from his best friend, Ron Dietz. John B. Grant Jr. passed away from cancer at the age of 54 in October, 2002. John was an attorney and well known in the grognard gaming community as a competitive, yet consummate, sportsman. He was a regular at WBC, having attended the first Avaloncon in 1991. John was patient, courteous, and highly sought after as an opponent. He took first place wood in both Russian Front and Battle of the Bulge 1981. John’s favorite game was Avalon Hill’s Bitter Woods. He contributed to the design as both a playtester and rules editor. According to game designer and close friend, Randy Heller, the hobby hasn't been quite the same since John’s passing. Wes Letzin, a World War II veteran, competed in War At Sea at the 1991, 1992, and 1993 Avaloncons. Vince Meconi received the following e-mail from his son Tim: “Mr. Meconi, I regret to inform you of the passing of my father, Wes Letzin. He was an avid wargamer and though he enjoyed many different games, he only played one face-to-face: War At Sea! He really enjoyed playing at the conventions. You, and others, brought a lot of joy to my father and I wanted to thank you for that! Even when he was too sick to go anymore, he would keep up on the latest news from the WAS front. I’m also glad that Avalon Hill stayed around until after his death! Thank you again for all your efforts, I know it’s not easy!!! Contributed by Tim Letzin.